Product Description: The stylist series panel meters are available in window mount and surface mount styles and all meters meet ANSI specification C39.1. These meters are available in a variety of sizes, from 1.5 to 4.5in, and feature a 90 degree arc in the AC iron vane version and a 95 degree deflection in the taut band and pivot and jewel models. Accuracy: All DC and AC iron vane, +-2% of fullscale, AC rectifier type; +-3% of fullscale (60 Hz sinewave). Expanded scale voltmeters +-5% of fullscale. Special order DC with mirror back scale (DC only) 3-1/2 - 4-1/2in Available at +-1%. Overload: Voltmeters (AC + DC) - 50% momentary, 20% sustained. 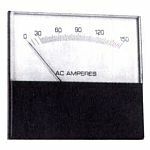 Ammeters (AC +DC) momentary: 10 times the rated current for 10 consecutive intervals of .5 seconds with 1 minute interval between successive applications; sustained: 20% for six hours. Burden Data: AC Ammeter 5 amps at 60 Hz, 0.5VA, Max. .5 Power factor lagging, AC voltmeter - unity power factor. Severe-duty meters are available to meet CUL or UL 1437 requirements in 2-1/2in - 4-1/2in sizes. Taut Band: Taut band is a means of suspending the moving mechanism between two ribbons of metal, obviating the need for pivots, jewels and control springs found in conventional mechanisms. The absence of friction resulting from this permits greater sensitivities and provides more rugged meters.Common failures of conventional meters subjected to shock testing are cracked jewels and/or blunted pivots. Taut band, without pivot and jewels, consequently, will withstand shock in excess of that specified for pivot and jewel meters. For example, ANSI Specifications for panel meters require 50G shock. Taut-band meters will withstand 100G shock. Pivot and Jewel: In this design the coil and pointer are supported by polished steel pivots at each end which fit into jewel bearings. Pivot and jewel meters are recommended for high vibration environments because of the mechanisms inherent stability and strength. Accuracy and repeatability are almost equal to the taut-bands, and good performance from the pivot and jewel construction is the reason for its long popularity. Dont specify pivot and jewel meters for applications that involve high shock, but do take advantage of this meters ability to withstand vibration. Frequency Effect- AC Meters: Iron vane voltmeters are sensitive to frequency and should not be used on frequencies other than design frequency. (Standard voltmeters are calibrated at 60 Hertz. Used at 50 Hertz, accuracy becomes +-2-1/4%. There are also 150- and 300-volt ratings listed which are calibrated at 400 Hertz). For calibrations at frequencies other than 60 and 400 Hertz, refer to factory.